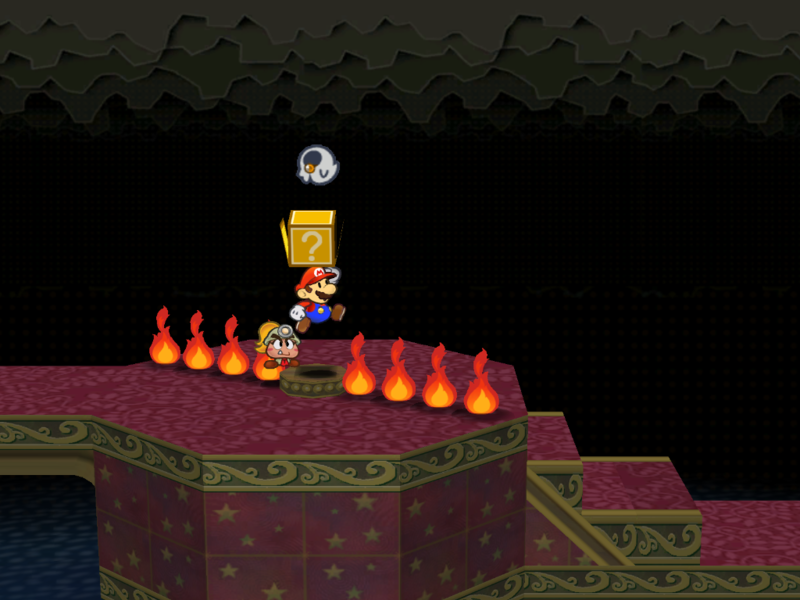 My favourite game of all time is without a doubt Paper Mario: The Thousand Year-Door, for many, many reasons. If I was to name them all, I'd be here till the end of my life - and that's certainly not going to work out very well. Spoilers lay ahead. If for some reason you've not played this game, stop reading, turn the computer/phone off, and go and play it. The first chapter of the game is certainly enjoyable, but naturally more simple than the later chapters in order to help newbies get into the flow of the game. It's got some nice scenic design both in the vibrant town of Petalburg and the humorously ruined Hooktail Castle; however, due to such simplicity, it isn't as memorable as it's successors once over. Hooktail is an entertaining boss battle, and quite a clever one given that you have to locate her weakness beforehand, though the newbies may find her abnormally difficult if they're not used to the gameplay style and aren't fully aware with how to find the hidden item that makes battling her miles easier; not an ideal trait for the first boss of the game. But regardless, while this isn't the best chapter, it's still good fun - not any part of this game is bad. No way. 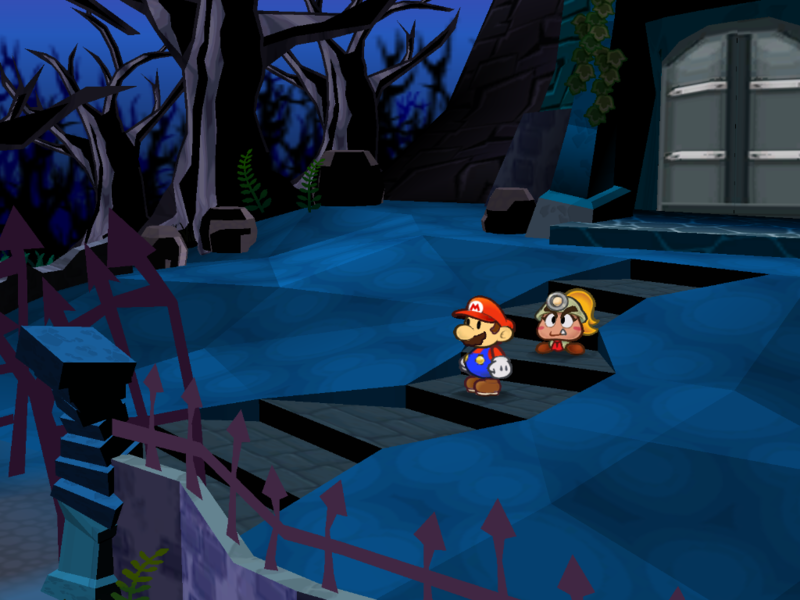 The second chapter takes place within the monochrome Boggly Woods, where Mario must help a band of small creatures named Punies save their home, the Great Boggly Tree, from the evil X-Nauts. The design of the woods is largely without colour, making it both calm and strangely bittersweet, and the relaxing music is a beautiful compliment to the visually resplendent backgrounds. The tree itself is just as pretty on the inside, and there's some clever puzzle solving throughout it's many passages that slowly help to advance your skills. The main annoyance is those bloody Punies, which Mario must eventually guide throughout the tree to safety. It's not so frustrating when it comes to moving them across gaps and through passageways, but there's some exasperating times where they get stuck in absurd places or scatter all over the place when enemies appear. It isn't a game breaking issue when you get used to it and take it as a good challenge, but it can be a bit too frustrating now and then. In terms of the boss battle, that's a huge plus, as Magnus von Grapple is without a doubt one of the best in the game, with some superb music and a challenging appeal. A good chapter, and another entertaining step forward. Chapter seven takes a while to get going as Mario must find the wealthy Goldbob and the elusive General White to have their approval to, of course, blast Mario to the Moon in an almighty cannon at Fahr Outpost, home to a number of Russian Bob-Ombs. Finding General White is funny in hindsight as you must run around to several locales, only to discover you just missed him; however, when you play the game, this eventually gets tiresome and brings the narrative to an awkward halt. Once this is resolved, Mario is shot up to the Moon, and from there infiltrates the X-Naut Fortress in order to try and rescue Peach and defeat the villains once and for all. 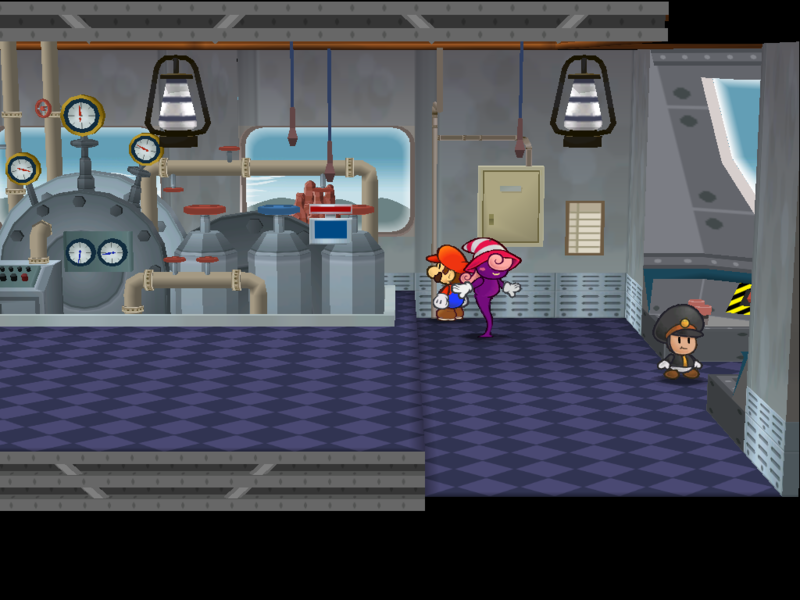 There is a strong emphasis on puzzle solving as Mario must navigate between various floors in the base's elevator in order to acquire numerous card keys and access codes to unlock new routes and proceed further onward. Nothing is easily laid out to the player directly, so this is where you're really put to the test as a newcomer; and an even harder boss battle awaits in the form of Magnus Von Grapple 2.0, a hefty upgrade of the original chapter two boss, who boasts much higher stats and some destructive new abilities. Less of an action packed chapter and more of a thought provoking one, this certainly succeeds as a worthy penultimate phase to the overall narrative. This time Mario journeys to the dark and dismal Twilight Town, which is under a horrific curse that sees the locals being turned into pigs whenever the haunting sound of the bell tower is heard. Mario journeys to the haunted Creepy Steeple to uncover the culprit, who turns out to be an obnoxious prankster named Doopliss, a Duplighost who has the ability to copy the appearance and abilities of his foes. A clever plot twist soon awaits - once Doopliss is beaten, the chapter initially seems to be completed, but this is all red herring. 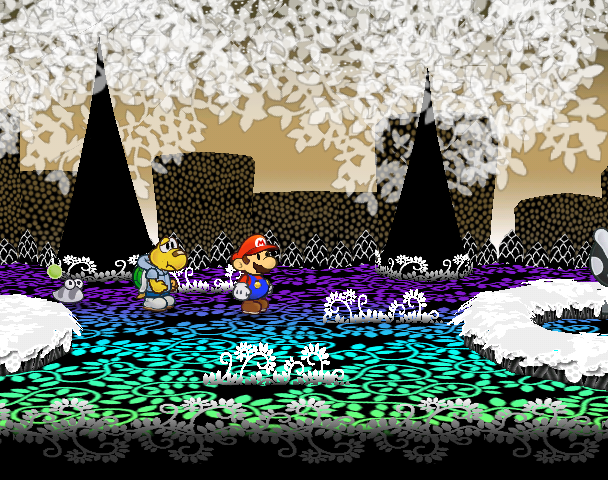 Doopliss takes the form of Mario and makes off with his friends, while Mario is left a featureless shadow who must recover his identity before time runs out. This plot twist later leads to Mario teaming up with former foe Vivian, whom we bond with further upon realising her abusive relationship with her wicked sisters. On an aesthetic scale, everything is spot on - the haunting, dim visuals of Twilight Town and the jet black appearance of Creepy Steeple create a perfect scary atmosphere, complimented by the bitter, dark music. Doopliss himself is a little too easy as a boss, but as a character, he makes for an entertaining, humorous villain, and finding the right path to recovering Mario's identity is a real brain teaser (in an entertaining way), even if it is sometimes a bit too vague. That aside, this chapter is one of the most creative, and certainly one of the most enjoyable from beginning to end. Chapter three has Mario flying up to the vibrant city of Glitzville, which is home to the renowned Glitz Pit, a fighting arena for the bravest and strongest of souls. To get the Crystal Star, seemingly visible as the prize for the champion, Mario enlists as a fighter and works his way up the ranks to win the title; but while doing so, he must also solve a mystery that includes a number of disappearances and strange threats from an unknown culprit. This chapter provides some of the most opportunities to rack up experience points and add tons of new foes to your Tattle Log; the higher up you go on the league table, the harder and more interesting the opponents become, and this all leads to a satisfying conclusion with a superb boss battle. The unnerving backstory behind this entire Glitz Pit mystery also leads to more gripping twists and some bittersweet sub plots, although sometimes the cutscenes are a little too long, throwing novels of text at you without mercy. With that aside, a host of memorable characters, witty dialogue, and a tense atmosphere benefit this chapter in a narrative sense, while the plethora of new enemies, stronger emphasis on fighting, and unique moments of exploration benefit it even more so in a gameplay one. 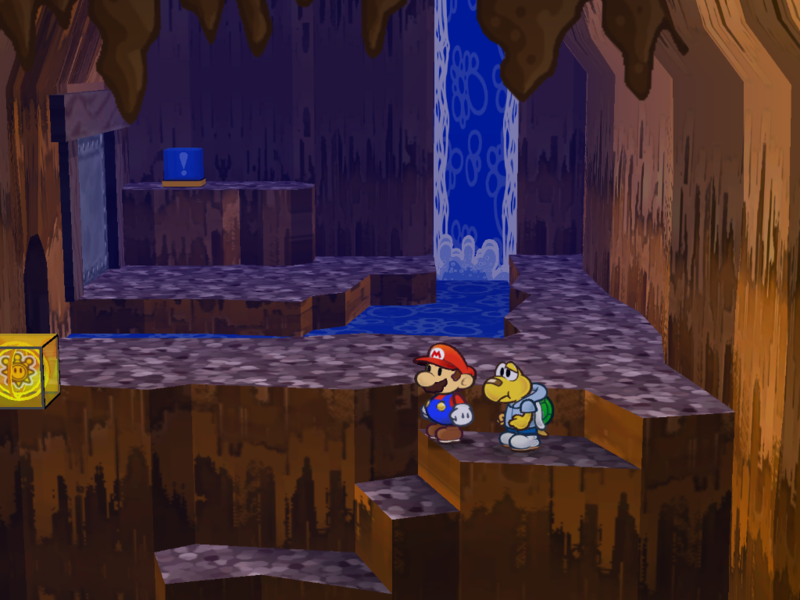 This chapter takes place on the remote island of Keelhaul Key, and inside the Pirate's Grotto; a layer of caverns that lead to the treasure of the ghost pirate Cortez. Before the chapter begins, one must find Admiral Bobbery within Rogueport and convince him to sail the seas again - and this already kicks off a compelling sub plot as we learn Bobbery's tragic past, and watch as he overcomes it to face his fears once more. The chapter features a band of interesting new supporting characters, namely Flavio, who brings a lot of comic relief to the table. In terms of gameplay, while it is occasionally frustrating to have to go back and forth through the island jungles so many times, it's still an equally testing experience and one that allows you uncover all sorts of new pathways and secrets. The final act takes us into the Pirate's Grotto, and is certainly one of the finest moments; the atmosphere is tense, the enemies are tough, and the variety of puzzles make for a wave of new challenges. Cortez himself is one of the most creative bosses in the game thanks to his battle being segmented into three rounds, with him altering his form, and consequently his attacks, in each one. The anticlimax of him handing over the Crystal Star is comic gold, and even when he's beaten, it's not quite over; one must then pummel Lord Crump and his attempts to destroy the cove and steal the star, which makes for another interesting boss battle and a gripping finale. The sixth chapter plays out like an Agatha Christie mystery novel, with a traditional detective story taking place on the renowned Excess Express as it journeys to Poshley Heights. The three day journey begins as normal, but soon enough, many strange events unfold; items are being stolen, threats are being made, and a general sense of unease floods each carriage. The main supporting character is Pennington, a wannabe detective who strives to solve the case alongside Mario, who brings a lot of charm and witty humour to the table. It's both atmospheric and humourous, with beautiful music covering the day, dusk, and night periods of the train journey, as well as the calm Riverside Station. 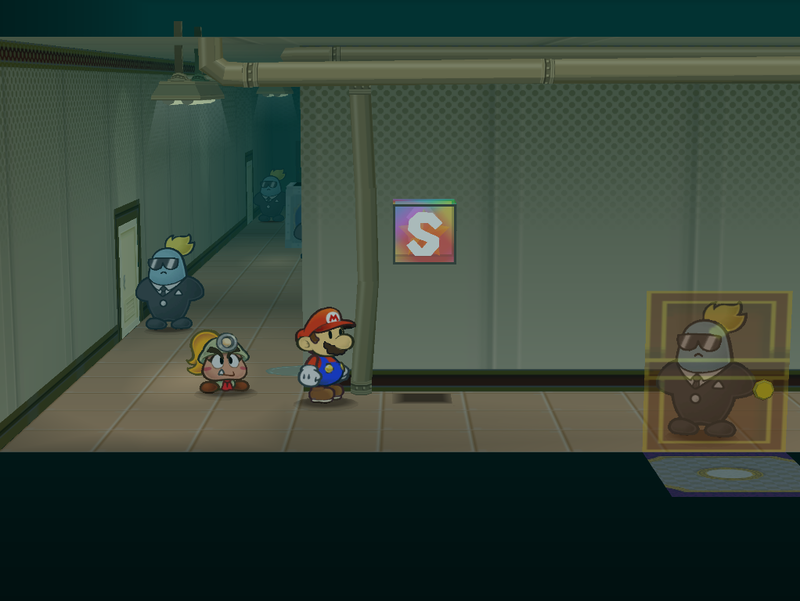 The station itself has an eerie atmosphere as Mario navigates within it to find a hidden switch, encountering strange creatures in the process that end up being the chapter's boss battle, Smorg. The boss itself is an epic fight on the roof of an out of control train that's both challenging and entertaining; in fact, in summary, all of this can be said for the entire chapter itself. The final chapter is a stellar and worthy conclusion to a beautifully written story, bringing together everything for an explosive finale full of challenge, thrills, and some major plot twists. The Palace of Shadow is an unnerving stage, exuding a traditional gothic horror vibe with classic scary artefacts and dimly lit corridors. The palace is split into three phases, and numerous bosses are present throughout; from the ferocious Gloomtail to good ol Bowser to, of course, the Shadow Queen herself. The Tower of Riddles, the second part of the level, is a particular favourite of mine, thanks to it's thought provoking puzzles and ambient, haunting music. You'll also encounter numerous tough enemies as you proceed, so this is where all the experience built up over the past chapters is truly put to the test. Puzzle solving, tactical fighting, and facing your fears are crucial parts to overcome what is easily the hardest yet most compelling part of the entire game. A thrilling climax for both the story and overall gameplay, and certainly a fantastic conclusion for one of the best games ever made.